The overarching aim of the foundation is to empower women and girls of marginalized groups through sustainable initiatives in the field of education, so as to enabling them to be economically and socially secure. Ramrati Education Complex (REC) at village Rampur Maniharan, Saharanpur, Uttar Pradesh has been engaged in educating underprivileged youth, especially girl child. VGCF provides different facilities to girl students in REC such as, free lunch, free bicycles, 50% discount on their admission fee, no fees for Nursery and LKG students etc. 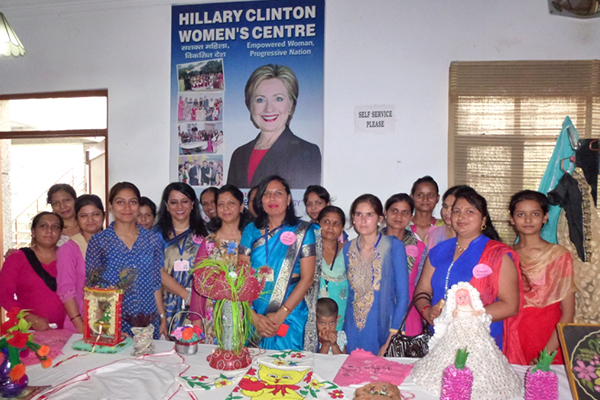 Started in December, 2011, Hillary Clinton Women’s Centre has been working interminably with a sole objective to empower the rural women through training and awareness programs. The centre holds regular trainings and skill development programs on variety of subjects, like handicraft, fashion designing, computer skill, cooking etc., to make them self dependant. Now these deprived women have opportunity at their door step to get skilled on sustainable livelihood and aware on legal rights available for them. At present more than 250 women from nearby villages are members of the centre.